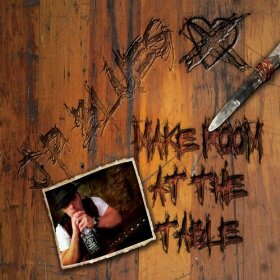 I just received the newest release, Make Room At The Table, from JP Blues and I really like it! Opening with Keep On Walking, a blues rocker with a Jim Dewer/Robin Trower feel. I really like the guitar tone that John Pagano (JP) gets on rhythm and his riffs are fluid and fresh. On Love So Cold, a slow blues track, JP lays out some great vocals and hot guitar riffs blended with the power blues riffs on the chorus not unlike Leslie West. With an fluid extended guitar solo taking the place of lead vocals JP shows that he is ready to stand toe to toe with the likes of today's young guns like Bonamassa and co. Lap steel work leads the way on Old Man Joe reminding me quite a bit of old Procol Harem, with a heavy background and powering drums by Yourico Scott and super guitar lead riffs from JP. On title track, Make Room At The Table, JP rides the slide in tandem with his vocals. I have always liked this technique and it is used effectively here. Another Time Another Place opens with a real nice bass solo by JP leading to a bluesy ballad. Delicate guitar riffs, double stops and volume swells add dynamics to this track which eventually explodes to a full guitar rip with vibrato bends and and soaring lead over really nice bass riffs. Excellent! Holy Roller is a flat out blues rocker with John Young on bass and really hot drumming from Shiloh Bloodworth. Good Enough, a funky rocker, is really a super toe tapper with JP on keys and guitars making fun music. I particularly like his vocals on this track and Johnathan Norwood holds down the bass on this hot potato. It's unusual that I ever like a remake of a track better than those that I've heard so many times but for the second time in a year or so (earlier report of Ruthie Foster on Ring of Fire), JP tackles classic Don't Let Me Be Misunderstood and really lays down a new bar to be raised. Playing complex Jimi like chords he sings with heavy soul and conviction. Really nice! Trouble On Heels is a cool track with back country blues sound. JP plays bass and slide on this track and rides it hard. Todd Smallie's presence on bass is immediately apparent on We Ain't Going Nowhere. A free form style of blues guitar solo plays into this track sounding a bit more like a loose jam but working well with rap track by RoSe LaFt. Wrapping the track is fast paced rocker, Day By Day. Having a bit of a British sound and classic rock construction, it could find it's way to broader audiences and airplay. This is a real strong outing for JP Blues. I think it will please existing fans and likely win JP a lot of new ones. (Oh... and I really like the cover).